In 2018, there were roughly 5,000 entrants to NPR's Tiny Desk Contest. There was one winner. His name is Naia Izumi, and we are beyond thrilled to welcome him to Fridays in the Asher 2019 in Cheyenne, Wyoming February 15th! Sarah Slaton Duo (Sarah Slaton, former lead singer of Edison and Sarah Joelle of Lola Rising) of Denver and Timothy John of Centennial, Wyoming will get an unforgettable night started. Naia Izumi is a one of a kind musician. With his dazzling, experimental, soulful compositions and incomparable vocals and guitar playing, Naia Izumi has drawn comparisons to singular talents such as Gary Clark Jr, Daniel Caesar, and the late Jeff Buckley. He's the experimentalism of Tash Sultana and Erykah Badu. His trajectory is rapidly on the rise, so you'll want to be sure to catch Naia here or else you might never see him in such an intimate setting again! Timothy John, of Centennial, is one of the Cowboy State's most soulful singer-songwriters. Timothy has received acclaim at numerous songwriting competitions in the region and is a regular in the Southeast Wyoming scene. This is his debut on our music series and we are thrilled to welcome him to the 2019 Fridays in the Asher lineup when he joins up with Naia Izumi and the Sarah Slaton Duo on February 15! Sarah Slaton, former front for the band Edison and Sarah Joelle, from Lola Rising, will be treating you with some awesome harmonies in this stripped down duo set. Fridays in the Asher has hosted some truly incredible concerts over the past few years and they have strived to continue to push their boundaries to bring top-notch talent to Cheyenne - this concert is perhaps their biggest step yet. They are calling this concert one of the most exciting acts they’ve ever had the privilege of hosting and are saying this is the best year for live music in Cheyenne, Wyoming yet. Fridays in the Asher is Cheyenne’s premier independent music and arts series. Established in 2012, we are a 100% not-for-profit and volunteer-organized series committed to providing high-quality entertainment and art to the community of Cheyenne for a low cost of admission. We operate through Arts Cheyenne, a 501(c)(3) organization, and run an annual concert series in the winter and spring months. Concerts are $5.00 admission at the door and beer and wine spirits are available for purchase for those 21+. Fridays in the Asher/Hynds headlining alumni include: Matthew Santos (Los Angeles, CA), Ayron Jones & The Way (Seattle, WA), Joe Hertler & The Rainbow Seekers (East Lansing, MI), Dirty Revival (Portland, OR), The Sink or Swim (Tempe, AZ), Wildermiss (Denver, CO), The Reminders (Colorado Springs, CO), Sur Ellz (Denver, CO), YaSi (Denver, CO), Gipsy Moon (Nederland, CO), Edison (Denver, CO), Slow Caves (Fort Collins, CO), Jalan Crossland (Ten Sleep, WY), The Patti Fiasco (Fort Collins, CO), Grayson Erhard (Denver, CO), and many others! September 27th-This week’s concert will consist of two talented Wyoming locals, Tie Hack and solo artist, Timothy John. This event will be held in the Wyoming Union Gardens. This performance will take place at 7:00pm. This show is free and open to the public. All ages are welcome. Be sure to come by and enjoy some soulful tunes. Tie Hack is a five-piece band, originating right here in Laramie. Tie Hack brings a unique country-folk sound with a twist of rock. Lead singer and writer for Tie Hack is no stranger to the StudioWYO stage. Last year, the hosted the last Open Mic Night of Spring 2018. To find out more about Tie Hack, or to hear their most recent track, “Cheyenne,” visit their Facebook at www.facebook.com/TieHackBand. Accompanying Tie Hack is soulful songwriter Timothy John. Timothy John is based out of Centennial, Wyoming. He is excited to share his original acoustic folk-rock songs with the Laramie community. Timothy is known for his original, melodic ballads, as well as his “unique percussive fingerpicking style.” This style allows for an intense blending of soft and subtle elements. To hear Timothy John’s debut album, “Hand for Help” or to learn more about him, visit his website at musicbytimothyjohn.com. StudioWYO is a student-run program sponsored by Associated Students Technical Services (ASTEC). StudioWYO is a live learning lab to support local music and student technicians in a professional environment utilizing top-of-the-line audiovisual equipment. With a new show each week, there is never a dull moment and always something new to be learned and experienced. For More information about StudioWYO and StudioWYO events, visit our Facebook at facebook.com/StudioWYO, or find us on Twitter or Instagram @StudioWYO. 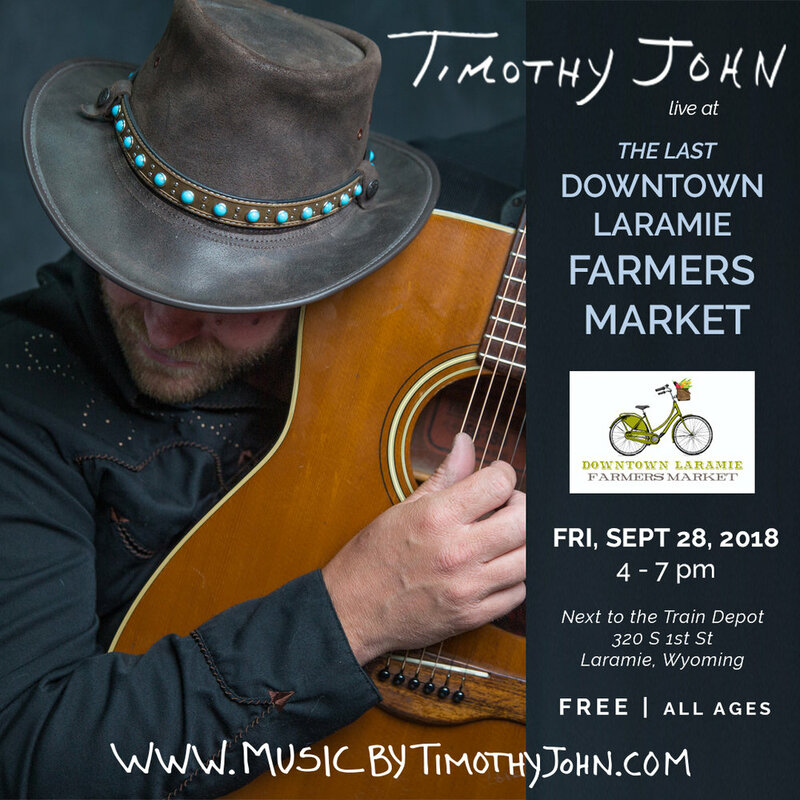 Independent artist and Centennial, Wyoming based soulful songwriter Timothy John Music (www.musicbytimothyjohn.com) will be performing live at the LAST Downtown Laramie Wyoming Laramie Farmer's Market Friday, September 28th, 2018 from 4 - 7 pm next to the Laramie Train Depot at 302 1st St in Laramie, Wyoming. The Laramie Farmer's Market runs June 29th - September 28th and features fresh produce, hand made goods, seasonal cocktails, live music and local arts. Independent artist and Centennial, Wyoming based soulful songwriter Timothy John Music (www.musicbytimothyjohn.com) will be performing live at the second night of the 2nd Annual I Slept With the Band Festival Saturday, September 1st, 2018 at 2:30pm at The Yard at 108 SE River St in Saratoga, Wyoming. I Slept With the Band Festival is a three day, traveling music and camping festival in the wild of northern Colorado and southern Wyoming featuring over 20 local and regional bands including Harley and the V Twins, Wendy Woo, The Symbols, Wooleye, AJ Fullerton, Eef and Stacey Turpenoff, Grace Kuch, Lauren Michaels, Sasha Stone, J Shogren, Bobby Phillips, Tyler T, B. Baldwin, The CatCalls, Riley Ann One Woman Band, Timothy John, Stompit, Ben Wah and the Blue Balls, The Honky Longtonkers, Tony Zain, and Lori Anne. Occurring on Labor day weekend, this festival gives fans a taste of the musician life. The bands play one venue all night, then load up their touring vehicles, and the fans and bands will then travel to the next venue together, play a show, camp, spend the night, wake up, and travel to the next venue. All 3 locations are stunning natural landscapes with friendly venues on them. This year's 3 locations will be: Friday, August 31st - The River Forks Inn, Drake, CO, Saturday, September 1st - The Yard, Saratoga, WY, and Sunday, September 2nd - The Sunset, Alcova, WY. Below is a ticket link and full lineup for the second night of the 2018 I SLEPT WITH THE BAND Festival at The Yard, 108 SE River St,Saratoga, Wyoming, USA. Visit Tim’s website www.musicbytimothyjohn.com to take a listen and for more information or visit https://www.isleptwiththeband.com for tickets, the full lineup, and festival details. If this sounds like a story you’d like to hear in song, then check out Hand of Help by Timothy John at www.musicbytimothyjohn.com And check Timothy John out at a live show." Watch Timothy John perform his best songs along with some of Laramie and Centennial, Wyoming's top singer/songwriters as they compete in the Wyoming State Singer/Songwriter Competition Qualifying Round on Sunday, August 19th, 2018 at 6pm at the Beartree Tavern and Cafe in Centennial, Wyoming at the base of the Snowy Range Mountains. In the Fall of 2012, the First Annual Laramie Singer-Songwriter Competition was held at the Buckhorn Bar in Laramie, Wyoming. Since that first night, there have been over 50 separate contestants across 18 nights of great music including 13 qualifying and 5 final rounds. The event has become an important cultural event for the Laramie community, bringing together musicians, poets, academics, lumberjacks, you name it -- a melting pot of great art. Each year leading up to the Laramie Singer-Songwriter Competition, a couple Wyoming residents have reached out and asked if they can compete, and every time the answer has been that this event is for Laramie residents only, but there was hope to expand Statewide eventually. Now it's finally happening, so come join the excitement, be ready to make some new friends and meet some new heroes telling Wyoming stories through original poetry and music. "No matter how you finish, everybody wins by sharing their art in a unique and supportive environment." 2) To give aspiring singer-songwriters a chance to perform their works in great venues with a listening audience. 3) To promote and recognize excellence in songwriting, an under-celebrated skill with the power to bring people and cultures together- ultimately creating a culture unique to Wyoming. Independent artist and Centennial, Wyoming based soulful songwriter Timothy John Music (www.musicbytimothyjohn.com) will be performing live at The WHAT Festival Sat, July 28th from 8:30-9:10pm at the Acoustic Stage in Centennial, Wyoming. What Fest is a Wyoming grassroots independent music festival featuring over 30 local and regional bands. Come experience Wyoming's Grassroots Music Festival in it's first time in a new location in Centennial, Wyoming featuring 30 local and regional bands, camping, art, food, and vendors! Visit https://www.whatfest.com for festival details. Vote for Timothy John for best acoustic act of the year for the 2018 Wyoming Country Music Awards! The Inaugural Wyoming Country Music Awards covers Country, Americana/Roots, and more and just released the list of nominees for their first awards presentation for music in the state of Wyoming on Tuesday, April 17, 2018. Voting is currently underway and is open to anyone with a name and an e-mail address. Head to this page to vote. Voting will take place until May 15th. Click here to see a list of all nominees released by the organization, compiled through nominations that were accepted through April 15th. Click the links for information about each nominee, including direct links to the hear the songs and albums nominated in their respective categories. The Wyoming Country Music Awards™ red carpet event is scheduled to be hosted in July of 2018 in Cheyenne, Wyoming. "Hand of Help" by Timothy John is now available! 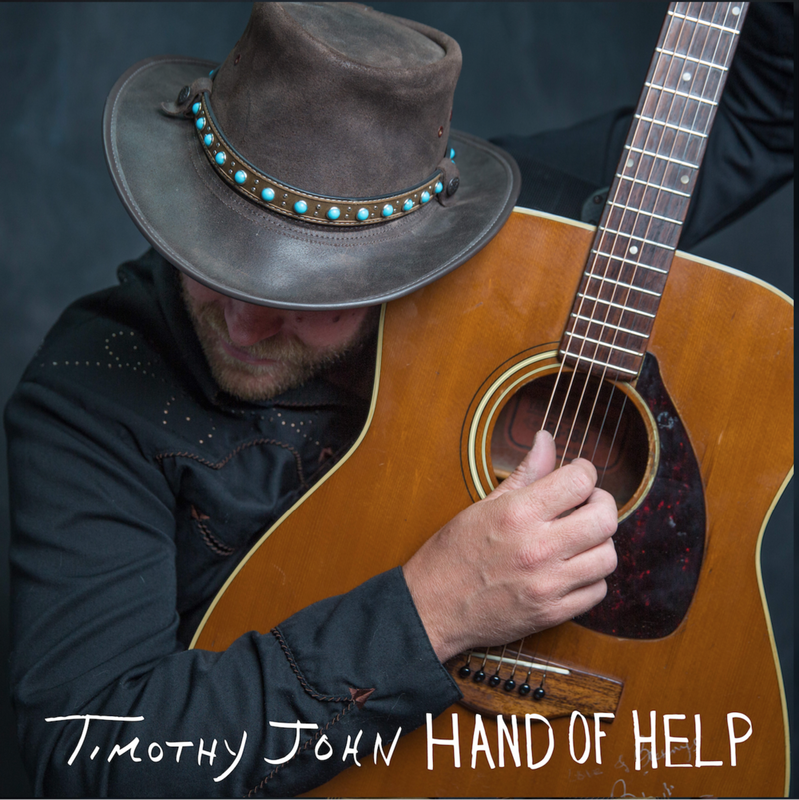 Independent artist and Centennial, Wyoming based soulful songwriter Timothy John's debut album “Hand of Help,” is now available after release on April 21, 2018. The album was recorded in two studio sessions during the winter of 2017 at The Recordium in Fort Collins, Colorado by professional sound engineer and guitarist Jasco Duende (https://jascoguitar.com) from Blinddog Smokin’ and The Symbols. The official album release concert featured a special performance from Fort Collins, Colorado based rock/soul/blues/funk trio The Symbols (https://www.thesymbols.net), who recently returned in January 2018 as semi-finalists from the 34th International Blues Challenge in Memphis, TN. The album release concert took place on Saturday, April 21st, 2018 at 8pm at The Beartree Tavern and Cafe in Centennial, Wyoming at the base of the Snowy Range Mountains. “Hand of Help" is available for purchase and is shipped to you directly from the artist on our website www.musicbytimothyjohn.com with free delivery in Laramie or Centennial, Wyoming, or download "Hand of Help" by Timothy John on iTunes Store, CD Baby, Bandcamp, Amazon Music, and Google Play. Please visit Tim’s website https://www.musicbytimothyjohn.com/music to take a listen and get a CD. Thanks to Susan for the new photograph! Thank you Susan Moldenhauer for the black and white photograph from my 'Hand of Help' CD release party! No sled dogs were harmed in the making of this video. “Hand of Help" is available for purchase and is shipped to you directly from the artist on our website https://www.musicbytimothyjohn.com with free delivery in Laramie or Centennial, Wyoming, or download "Hand of Help" by Timothy John on iTunes Store, CD Baby, Bandcamp, Amazon Music, and Google Play. Be the first to grab a copy of our debut album! Listen to "Smile" by the Symbols who are playing at our album release concert! I am looking forward to hearing The Symbols at my album release concert April 21st at Beartree Tavern and Cafe. Jasco Duende reminds me of a cross between Randy Rhoads, Jeff Beck, and Eddie Van Halen. His playing is fast, clean, soulful, and inventive. I can't stop watching his hands when he plays. Mer Sal is a factory of creative ideas and talent. On and off the stage Mer is a perpetual Rock and Roll Deva. It is no act. She is exactly that. She truly loves what she does. Don't have a room yet for our CD release concert? The 21st of April is coming soon! It may be too cold for a tent, but there are rooms to rent. Book soon for Timothy John's debut album "Hand of Help" CD release concert with The Symbols! Mountain View Historic Hotel & Cafe, Centennial WY – In downtown Centennial; visit their website http://www.themountainviewhotel.com/ or call 307-742-3588 for more information and reservations. 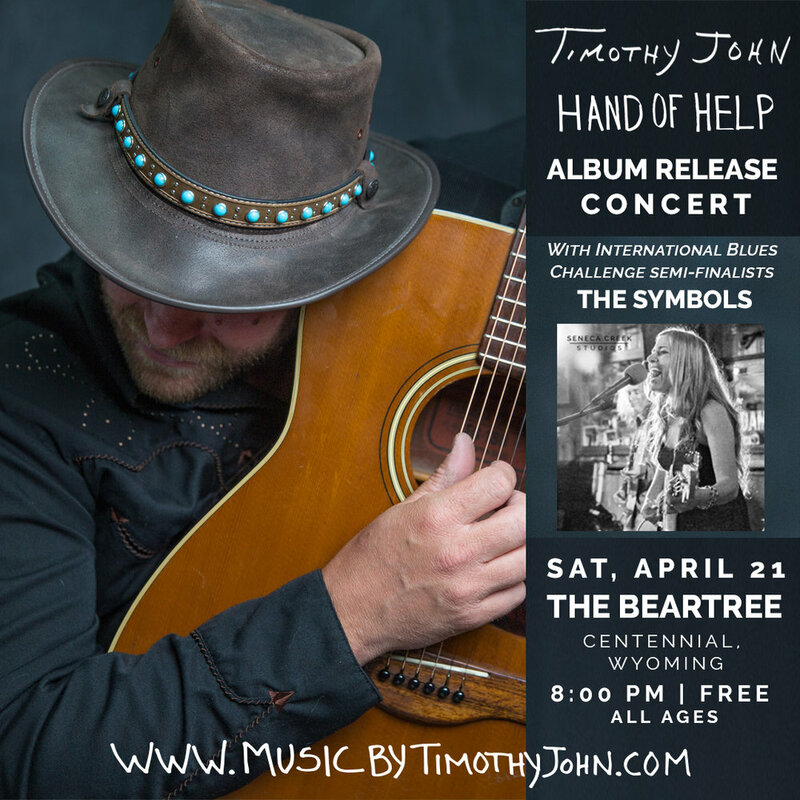 LARAMIE, WYOMING – Independent artist and Centennial, Wyoming based soulful songwriter Timothy John is thrilled to announce the release of his debut album, “Hand of Help,” available on April 21, 2018. The official album release concert is free and open to the public and will feature a special performance from Fort Collins, Colorado based rock/soul/blues/funk trio The Symbols (https://www.thesymbols.net), who recently returned in January 2018 as semi-finalists from the 34th International Blues Challenge in Memphis, TN. The album release concert will take place on Saturday, April 21st, 2018 at 8pm at The Beartree Tavern and Cafe in Centennial, Wyoming at the base of the Snowy Range Mountains. Come early for dinner or to play in the mountains and stay late to celebrate and be a part of a special one-of-a-kind show you don’t want to miss. Visit Tim’s website www.musicbytimothyjohn.com or RSVP on Facebook at https://www.facebook.com/events/146902062666150 for more information and hope you can be there to celebrate with us. It will be a fun evening of music on the mountainside. - Mountain View Historic Hotel & Cafe, Centennial WY – In downtown Centennial; visit their website http://www.themountainviewhotel.com/ or call 307-742-3588 for more information and reservations. Timothy John is available for phone and video interviews. Please call 307-298-0462 or email timothy.james.john@gmail.com to set up a time that is convenient. Please visit Tim’s online press kit at www.musicbytimothyjohn.com/epk for a full bio, photos, and more information. ORDER YOUR COPY OF "HAND OF HELP"